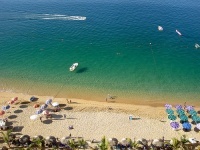 Situated on one of the loveliest bays on the Mexican coast, backed by the evergreen vegetation of the Sierra foothills, Acapulco is the Queen of Mexican beach resorts, the loudest and most famous in the country with non-stop energy, high-rise hotels, a glittering nightlife, white beaches and an enormous range of holiday activities. The main attraction in Acapulco is the string of beaches that sweep around the bay, each offering a different atmosphere and ample opportunities for watersports, with calm waters, sun bathing and seafront dining of international quality. The downside of Acapulco city is the shabby, polluted and overcrowded old town area, but it is easy enough to ignore this side of Acapulco with plenty to keep visitors happy along the glitzy holiday resort strip, with its shopping plazas, restaurants and beaches. A famous Acapulco institution since the 1930s are the Quebrada cliff divers, who pitch themselves gracefully from a height of 148ft (45m) into the seemingly shallow water of a narrow chasm in the ocean below after praying at the small rock shrine for safety. One of the pleasures of a holiday in Acapulco is shopping for souvenirs, of which there is a plentiful, varied selection gathered from all over Mexico. Handmade leather goods, locally made textiles, beautiful pieces of silver jewellery, bright and lovely ceramics, and even inspiring paintings by local artists are just some of the things on offer in the markets, stores and beachfront stalls. The older areas of Acapulco have a number of well-priced tailors and quaint souvenir shops. A good spot to indulge in some bargain hunting is the open-air artisan's mall opposite the Plaza Bahia, where it is possible to do a little haggling for arts and crafts. The native-made goods may be appealing, but just as desirable for avid shoppers are the many upscale boutiques selling well known designer labels which pepper the streets of the Zona Dorada (Golden Zone), also dubbed Mexico's 'Sunset Boulevard'. As far as modern malls go, Acapulco's biggest, complete with food court and cinemas, is Le Gran Plaza, situated on the Costera. Acapulco's scenic setting around a picturesque bay allows for some magical and romantic dining opportunities in a multitude of restaurants while on holiday. Cuisine of all sorts is on offer, the quality generally very high and the prices reasonable. Some of the best restaurants use a fusion of styles and cuisines to create something unique and special, like the Kookaburra, with its spectacular terrace views of Acapulco Bay, creating delicious French dishes prepared with Mexican ingredients. Mexican seafood is a top favourite with visitors, a fact well exploited by most establishments, like the El Amigo Miguel off the main town square, where delicious shrimp and grilled red snapper medleys are specialities of the house. Flashing lights, pumping music and boundless energy are the characteristics of Acapulco's frenetic nightlife, which centres on the clubs and discos of the main strip and Las Brisas. Clubs like the renowned Palladium, where the legendary 'silver man' fire dancer performs in the early morning hours, make Acapulco a hot favourite destination for young spring-break revellers from the USA. Those looking for a more Latin experience head down to Ninas, a traditional Mexican salsa club where the locals burn up the dance floor. For visitors interested in seeing some authentic Latin American Salsa dancing, head to Salon Q, 'the cathedral of salsa'. Disco Beach on Costera Aleman is well known for its popular Friday night foam parties. Mandara up on the side of the mountain, with its panoramic views of Acapulco by night, is one of the best places to end your evening and wait for the sun to rise before another day on the beach. Most of the dance clubs open at 11pm, close at 6am, and charge a fairly steep entrance fee, but this often includes 'all you can drink'. Those taking a break from dancing can enjoy bar-hopping along the Costera, which is lined with numerous exuberant open-air watering holes. On holiday it is difficult to resist the lure of Acapulco's golden beaches, but there are numerous things to do away from the sea and sand. Active pursuits like bungy jumping, horseriding, mountain biking, golf on one of four great championship courses, or tennis are available. Local operators offer popular jungle tours, taking visitors into the Laguna de Tres Palos swamp to play at being Tarzan among the tropical vegetation. There are numerous other excursions on offer, from swimming with dolphins to snorkelling expeditions, from folklore shows to sunset cruises. There is often an oily layer on the seawater of Acapulco from the use of jet skis. Visitors to Acapulco are strongly advised to avoid the resort during America's spring break in mid-March as hoards of student revellers descend on Acapulco for spring break mayhem and partying.